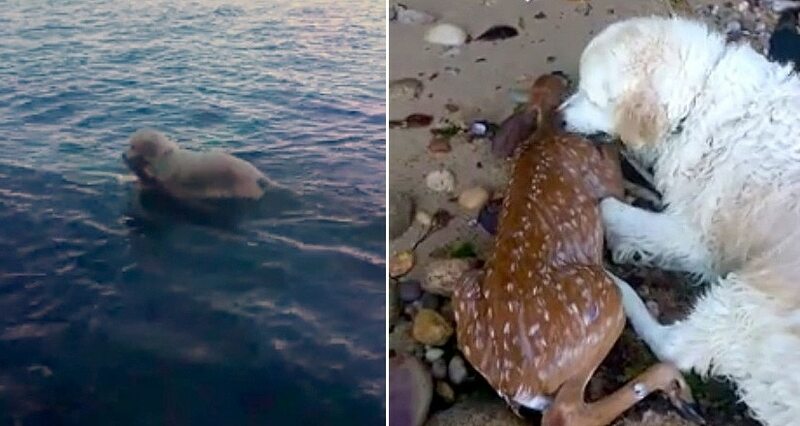 A New York dog out for a walk on a beach got the chance to be a hero when he dove into the water and pulled out a fawn who had darted out into the waves and couldn’t make its way back to shore. Mark Freeley was walking on a beach in Port Jefferson with his dogs Sara and Storm when they spotted a fawn that had gotten itself into some trouble. “Storm just plunged into the water and started swimming out to the fawn, grabbed it by the neck, and started swimming to shore,” he told CBS New York. The English golden retriever lived up to the name of his kind and duly fetched the stranded baby and pulled it all the way onto the sand, protectively lying down next to it. “And then he started nudging it, and started pulling it to make sure it was gonna be ok I guess,” Freeley explained. The dog dad called rescuers, but when they arrived the poor thing was frightened back into the water, possibly by the dogs. Freeley said that “this time it went out even further,” so he and Frank Floridia of Strong Island Rescue waded out in the water to save it together. Tension filled the air for the eight minutes it took for them to get a rope around the fawn and reel it in. Floridia says much of the credit belongs to his partner, Erica Kutzing, who ran about a mile on the beach to help with the rescue and carried the ailing animal to their van. The baby was loaded with ticks and had sustained an eye injury, but is now being cared for at a local rescue group until it is well enough to be released back into the wild. Spa Dogs: Watch little Chi Help His Friend At Bath Time! It’s 5 O’Clock Somewhere … Time For A Dog Beer! First of all Storm and Sara have an amazing wonderful dad that trained them with love. Thank goodness for people who love thier dogs and other animals. Storm is a beautiful beautiful loving dog that was trying to save another life. I couldn’t stop my tears of joy. Good boy Stormmy.